When I read about Donna Hay challenge at JungleFrog-cooking blog I was so excited. About a year ago I found a Flickr group that did the same thing. I tried only once and then the challenge was over. So this time I knew I needed to get myself together and do my best. Basically a photo is picked every month from Donna Hay magazine (this month’s photo is by Chris Court). The challenge is to replicate the photo. So you make a dish, style it and take a picture. Sounds easy, doesn’t it? It’s great way to learn. Trying to achieve exact output gives you a knowledge what elements of which elements of photography and styling are your Achilles’ heel. I read a few comments by people who feared that this kind of challenge maight teach you copycat, and thought you should find your own style. I don’t think there is risk. For beginners like me, it’s a great way to learn the basics and explore the food photography. 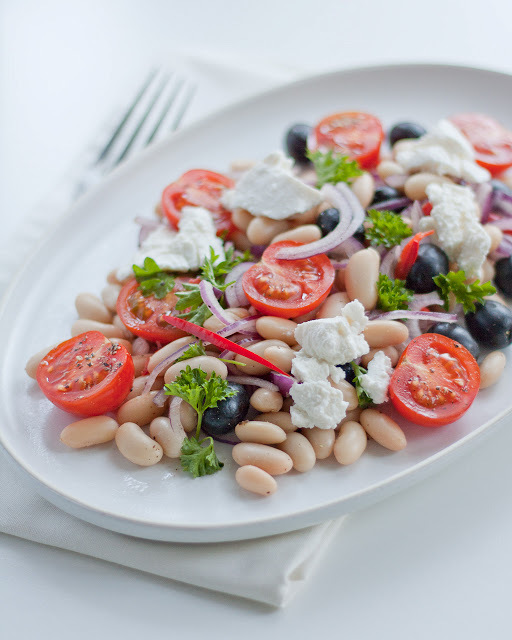 The photo and recipe that Simone has chosen looked pretty simple. After some chopping in the beginning, you could focused on taking photos. I knew that working with natural light would be tricky, but I didn’t think that it would be such a challenge! It was a cloudy afternoon. I set up my boyfriend’s new tripod. I put a plate (that I bought specially for this photo shot) and a fork on my white cupboard (which I brought in from my bedroom). I took the first photo. And… my plate looked fat! It wasn’t oblong; it was almost circle. Did I take the picture from right angle? I don’t know, it should probably have been taken from a more overhead angle. But I focused on the light. Surprisingly, there was too much light and shadows were too dark. I put the salad on the plate and decided to fight. I used some white foam to lighten up the shadows, and it worked, but just a little bit. I changed the position of the plate. I changed the position of the fork. The fork reflected the light. It shouldn’t! How can you convince a fork not too do it? I took plenty of photos. There wasn’t much difference. So you see, that wasn’t easy. I’m still left with many unanswered questions. Am I happy with the result? I would say not really. I’m glad I’ve tried, but I should have tried more angles, and I could have taken pictures at different times to check how light was changing. I should find something to defuse light, I don’t even have white sheet! I like the photo. I wouldn’t have chosen this kind of stylisation by myself. And what do you think about my work? Any tips? 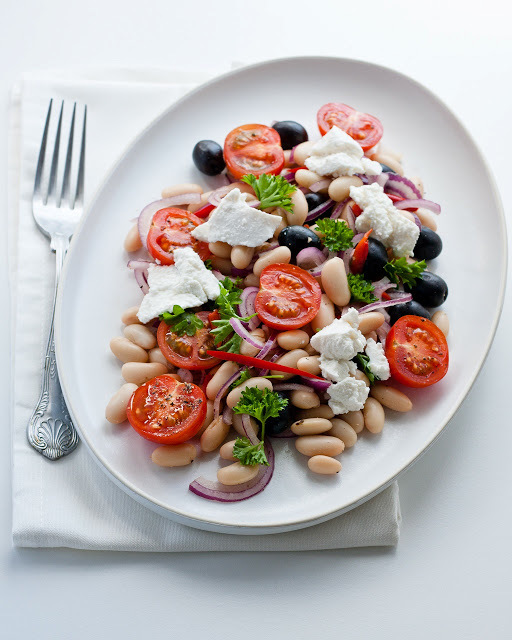 Place the beans, onion, olives, parsley, chilli, tomato, salt and pepper in a bowl and toss gently to combine. Divide between serving plates and top with fresh ricotta. Combine the oil and vinegar and spoon over the salad to serve. Posted in Salads and veggies and tagged beans, olives, tomatoes. Bookmark the permalink. Thanks so much for joining in the challenge Magda! I totally love that last photo. I think it is brilliant and better then the overhead one. As for getting rid of reflections; I use tracing paper quite a lot as that is really cheap and a good way to limit reflections or light that is too harsh. That bluish light is tricky indeed. Looking back at the photo I took of the dish (which is two years ago…) it is much more yellowish or warmer light then Donna’s. So I didn’t pay enough attention to that either. Ilva made it as well and she did set her plate up on the shadow site of the house which tends to have a bluish cast.If you use foamboard for lighting up the shadows and you find that it is not giving you enough bounce, try and add some aluminium foil around the board or use a silver reflector. That will give you more bounce and will usually do the trick. The angle you place your reflector is also pretty important.Overall; great job Magda! Thanks Simone. Great tips. I will try to use them with next photos. Can’t wait for the next challenge. Thanks for you comment Magda. Simone has given you great advice already and agree with her that the second photo is the better one because of the light. One nitpicky thing though, a food styling thing: you could have distributed the olive more evenly, now they are on the top part mostly. For this kind of photos, I usually compose the plates, adding each ingredient in layers and looking at the overall impression all the time. Though my food styling is brutish compared to a real food stylist’s work…anyway, I think you did a really great job of it and I am happy to be part of the same challenge as you, sharing the fun! Thank you Ilva. I must admit I didn’t even noticed that. I tossed most of the ingredients and left some to garnish. But I was so focus on getting onion and chilli right, that I missed olives. Thank you for good tip, I will try to be more careful next time 🙂 It was a pleasure to take the challenge with pros like you, Meeta and Simone. 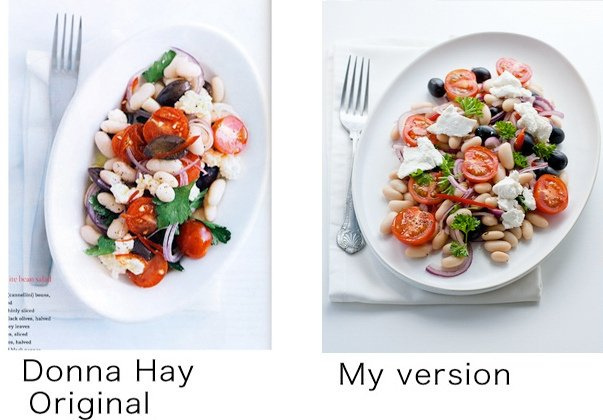 Your photo looks way better than the original and I must say I love me some white bean salad, so thanks for sharing! Thank you Elise. I hope you will like it. I think yours looks gorgeous. You are falling in with the right people to learn from Magda. Meeta, Simone, and Ilva are the experts for sure and so talented. Good for you to join the challenge. I am way too chicken to throw my ring in the hat when it comes to photography. Thank you Mona. I love beautiful photography, but I’m often to impatient. Meeta, Simone and Ilva are great, I don’t even compare myself to them. But I need to practice to get better. Magdo, twoja sałatka wygląda niezwykle zachęcająco i ładniej na zdjęciach niż u Donny Hay. Tak jak słusznie piszesz ich zdjęcie jest zaniebieszczone, a u Ciebie jest piękne światło, zwłaszcza na pomidorach. Lekko błyszczą. dzięki czemu wydają się wilgotne, soczyste i apetyczne. Świetne zdjęcia! Tak trzymać. Pozdrawiam serdecznie. Dziękuję Agnieszko za odwiedziny i za miłe słowa.